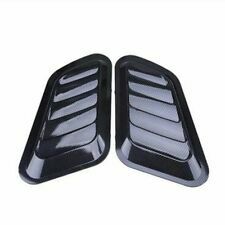 Universal Pair Car Decorative Air Flow Intake Scoop Turbo Bonnet Vent Cover Hood Fender Carbon fiber. 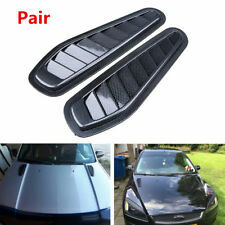 Pair Car Decorative Intake Scoop Turbo Bonnet Vent Cover Hood Fender Carbon fiber. Color:Carbon fiber. These stainless steel radiator hose kits are designed to replace your standard rubber radiator hoses. These can be used for Upper Radiator Hose or Lower Radiator Hose. Hose Clamp Covers Included Yes. 36" stainless steel universal flex hose kit. 1pcs 36" stainless steel universal flex hose kit. Flexible design eliminates the hassle of finding a rubber hose with just the right bends. This kit can be used with 1 1/4", 1 1/2", or 1 3/4" radiator necks. 1 x silicone reducer. 76mm 3" Car Cold Air Intake Induction Pipe Filter Tube System Kit Universal Blue. 1 x silicone vacuum hose. Material: aluminum, silicone, stainless steel. 1 x aluminum tube. We will try our best to make you satisfy. Red Car Hood Vent Spacer Riser Kits For Engine Motor Swap Fit Ford Chevy Nissan. 4 Hood Spacers. Constructed From Aircraft Grade 6061 Hard Anodized Billet Aluminum. Add That Finishing Touch To Your Engine Bay Adding An Agressive Look! 1PC White Car Hood Door Decoration Sticker Compass Style Vinyl Decal Waterproof. Universal Car DIY White Vinyl Decal Waterproof Long Strip Decoration Sticker. Note: The vent only for decoration but not real air vent.